SO THEN… Elodie Bergot, the mistress of injustice at the EPO (Battistelli’s henchwoman who throws false charges at people in order to render them unemployed, especially if they’re in the union), has been trying to entrap SUEPO again, in order to save face or keep up appearances, making it appear as though Battistelli is interested in union recognition while in reality he busts the unions like a madman, even when explicitly asked by his ‘supervisors’ (turned chinchillas) to refrain from doing so. What an evil woman! It’s not exactly surprising considering how she got her job at the EPO [1, 2, 3, 4]. Perfect fit for Battistelli. Here is the latest letter, dated yesterday, sent by SUEPO in response to the above letters, which are laughable at best given some of the latest developments. - Any discussion on how to “negotiate” would, we believe, be superfluous in a system that was broadly “in line with fundamental rights”. - Any further discussion to try and persuade SUEPO to accept the same MoU signed by FFPE is pointless when, as stated in Ms Bergot’s letter of 14 November 2016, the Office is unwilling to deviate in any way from the existing text. If the Office is not open to negotiating a MoU to the satisfaction of both parties, there is nothing to discuss. A MoU should be the formal, written acknowledgement of a negotiated and agreed procedure on a particular issue: it is not a capitulation from one party to the unilaterally determined terms and conditions of another. For the avoidance of any doubt, we believe your MoU is so biased, that it practically asks the Union to abdicate its fundamental rights. Under these circumstances, there would appear to be nothing further for us to discuss on the current proposal. - However, as you stated in the last Administrative Council meeting you would be prepared for to hold discussions without any precondition. Thus, this could be a way forward. We would like to remind you that these discussions should be held within the tripartite negotiation framework. Furthermore, we remind you that prior to resuming discussions, we asked the Office to assure our officials that they will enjoy a safe environment within which negotiations take place. Again, this would normally be a “given” in a system broadly “in line with fundamental rights”. However, as recent events have clearly shown, this seems to be far from the case in the EPO, where the President apparently ignores even the instructions of the highest legislative and supervisory body in the EPO, the Administrative Council. As already indicated by the staff representatives and repeated in the last Council meeting, the basis to restart any social dialogue is to follow-up and implements the Council resolution of March this year. One of the stipulations was that disciplinary proceedings need to be “seen to be fair”: this means that pending the provision of revised and new investigation and disciplinary proceedings, any ongoing investigation or disciplinary proceedings must be suspended. Please note that this was reiterated by the Council. Furthermore, the already imposed disciplinary sanctions against staff representatives and union officials need also to be seen to be fair. Again, in line with the Council resolution, this would require to withdraw or at least suspend the sanctions pending a review of the cases with “the involvement of an external reviewer or of arbitration or mediation”. We note that in the recent Council you committed to present revised investigation, disciplinary and dispute resolution procedures for approval in the June 2017 Council. We are prepared to contribute to any discussions on these issues within the framework of the tripartite negotiations. 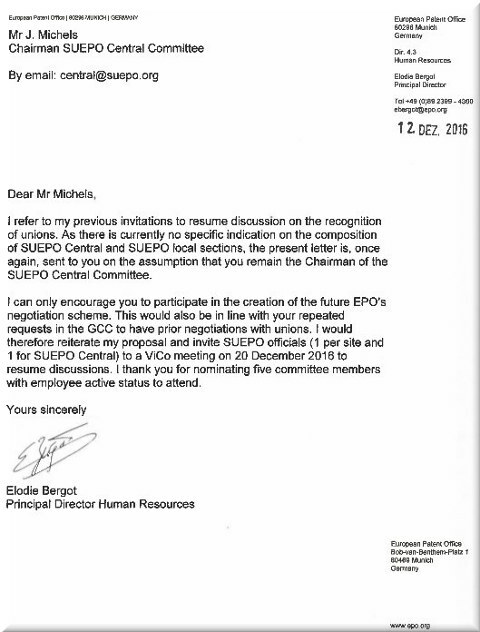 We also note the attempt in the final sentence of Ms Bergot’s letter (of 12 December 2016) to dictate who may or may not be part of SUEPO’s negotiating team. Any such limitation constitutes an interference with our fundamental freedom of association. To conclude: the reopening of any discussions (including those on union recognition) is in your hands: commit to implementing the unanimous Council resolution; commit to recognising and enforcing fundamental rights; be open to bona fide negotiations through genuine dialogue; treat us as an equal social partner. Under these very normal conditions, we can surely work something out. Our message to SUEPO: don’t fall for it. Readers of ours have been insisting for a while that SUEPO has been far too gentle and courteous with Battistelli, who is an aggressive, manipulative thug. There’s no room for negotiation with someone like this, unless one wishes to be hired by him to become a mercenary. People we speak to (not even from the EPO) believe that SUEPO should escalate and start treating Battistelli as a combative, irrational person, not as a President. Otherwise they might continue to be crushed and repressed. One thing they can do is represent themselves anonymously (no names, no publicly-known structure). “Bureaucracy is spreading like cancer cells,” argued another person. So is corruption, bribery, fraud, etc. The EPO is full of that and it threatens those brave enough to point that out. Here is the full comment, which deals with the lack of large countries voting to send appeal boards away (while Battistelli gives "carrots" to small countries whose vote are of equal weight). - Finally the EPO ‘Trump-like bling tower’ in construction in TH (by a FR star architect) is late on schedule. This is likely to have a little (read A LOT OF) impact financially with costs sky rocketing soon. Thereto Minnoye is said to have failed (as site manager for The Hague to keep this on tracks). the Union FFPE-EPO always points out, that the beloved MoU is a “Gentleman’s Agreement”. Now it becomes clear, why the “official union” never complains. They knew right from the start how they’ll be treated, and are happy to sit at a table, to discuss things that are neither urgent, nor in need of their input anyway…. 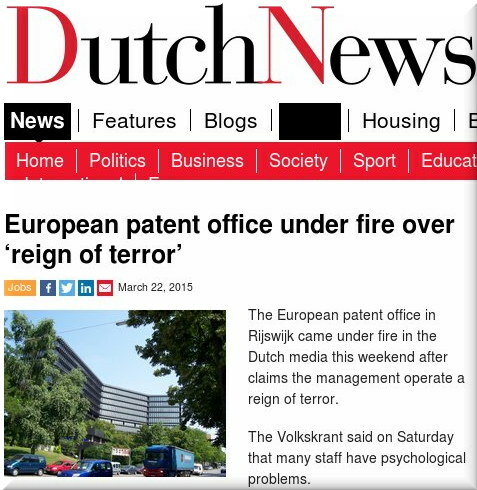 The EPO is not a patent office. It has become something political and something deeply disturbing where budget is thrown at relatives, friends, and is increasingly used as a vehicle for corrupting the media, buying ‘favours’, mislead the public and so on. 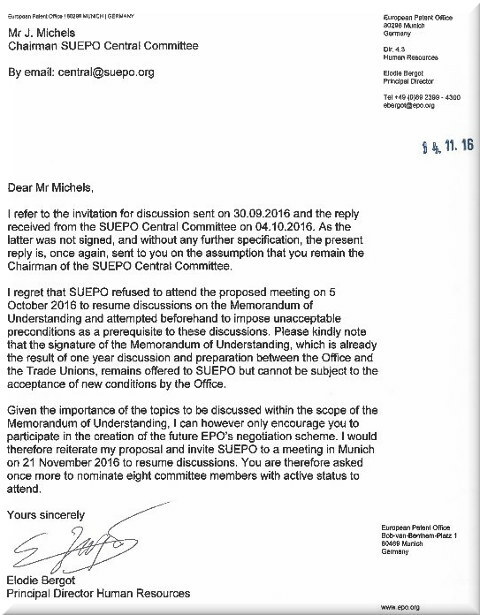 SUEPO needs to get even stronger and if fear of retaliation (or “reprisal” as they call it) is enough to discourage some from participating, then harness anonymity-preserving tools and give the EPO’s management a good fight because the EPO simply self-detonates under Battistelli (that’s exactly where the EPO has been heading). Staff unions exist to exercise of exert control over the institutions staff works for; right now there is one person turning not just the Office into a toy (for him to break) but also the Administrative Council into a toothless laughing stock. The whole Organisation is compromised and staff has a duty to serve stakeholders, including Europeans, not just some lunatic in a suit. WHEN this Web site was founded (2006) the EPO had already accepted that software was not patentable (before loopholes “as such”). The EPO was the least of our concerns! We were actually proud to say that software patents were no longer (much of) a problem in Europe. Battistelli ruined the EPO in so many ways, including patent scope. He treats patent-granting (or examination) processes like a production line, where the goal is to produce as much as possible as quickly as possible (patents were never like this!) and this is what he calls “success”. What can a President do when staff realises that examination is no longer being done improperly because of unrealistic “production” expectations? A reasonable President would listen to the staff and correct/rectify the error. But Battistelli is no President but a King and a ruthless tyrant. He’ll never ever admit an error. He’s crazy! “Thinking of applying to Praktika Intern? Applications close on 31 January 2017,” the EPO wrote today, promoting that same trend of picking interns rather than experienced full-time employees (who are walking away or find themselves illegally dismissed based on trumped-up/made-up charges, or simply fail to reach impossible-to-fulfill quotas). Make no mistake about it. The EPO grants A LOT of patents IN ERROR. Insiders told us so. They know so. They’re embarrassed to say so, but they feel compelled by ethics. Following last year’s decisions by the Enlarged Board of Appeal of the European Patent Office (“EPO”) on referrals G 2/12 and G2/13 (“Tomatoes II” and “Broccoli II”), the European Commission (“Commission”) issued an interpretative Notice on certain articles of the Directive 98/44/EC—known as the Biotechnology Directive—stating their view that when adopting Directive 98/44/EC, the EU legislator’s intention was to exclude from patentability products (plants/animals and plant/animal parts) that are obtained by means of essentially biological processes. The EPO announced on 12 December that it has stayed all examination and opposition proceedings relating to plants and animals obtained by an essentially biological process. This is because of a notice of the European Commission questioning the availability of patents in these fields. Following the Broccoli and Tomato cases (G2/12 Tomatoes II and G3/12 Broccoli II, discussed on the IPKat here), the Enlarged Board of the EPO ruled that even where an essentially biological process for the production of a plant or animal is not patentable, the resultant animal or plant may itself be patentable. This was on the basis that, effectively, the exclusion under Art. 54(3) EPC was an exclusion of a process, and there was no basis for giving this Article a broader interpretation. This decision did not go unnoticed by the powers of the EU, and in December 2015, the European Parliament adopted a resolution asking the European Commission to look into the patentability of products of essentially biological processes. This resulted, on 3 November, in the Commission adopting a Notice on certain articles of the Biotech Directive (2016/C 411/03), in which the Commission took a different view from that of the Enlarged Board. Well, the Enlarged Board of the EPO may not last much longer. Battistelli is in the process of squashing it because, based on a growing mountain of evidence, it doesn’t blindly accept Battistelli’s views and to make matter worse it’s actually granted — GASP — independence from the Office. That is absolutely not acceptable in Battistelli’s view, which is why he insisted that the chinchillas of the Council should send those people to exile (as they finally did a few days ago). THE EPO boasts the biggest liar in the world. Sepp Blatter is a Saint and an angel compared to him. The USPTO has some issues, but nobody ever dares compare it to anything like the EPO, where some executives would probably be in prison if they were not above the law. In some people’s views or minds, Battistelli employs terror tactics for ultimate control and he breaks national laws in the process. Yes, even Dutch politicians openly call it that and defend the characterisation with terms like “Gestapo” and “Reign of terror”. It’s almost an objective interpretation. “Such are the symptoms of psychopathy; Battistelli’s mental state seem to have made him incapable of admitting any errors; instead he attacks anyone who dares tell him the truth, even delegates over whom he has no authority.”Benoît Battistelli is a master of institutionally violent autocracy, yet he pretends to be a victim of violence. He is a master of hypocrisy, lies, etc. while he accuses others of falsehoods. Such are the symptoms of psychopathy; Battistelli’s mental state seem to have made him incapable of admitting any errors; instead he attacks anyone who dares tell him the truth, even delegates over whom he has no authority. May the European authorities do to him what they did to Sepp Blatter, but they probably lack the authority to do so. They cannot even enter EPO facilities without prior permission (e.g. to independently investigate suicides). And now, as we predicted last night, the EPO’s President shamelessly exploits the Berlin attack (warning: epo.org link). How about victims (fatalities) of the EPO's legal bullying and Battistelli's reign of terror? Did Battistelli fail to spot the hypocrisy? Is he senile or something? “European Patent Office condemns blind hatred,” he wrote, yet anything Battistelli does seems to be driven by vengeance and hatred. Spot the hypocrisy from this man who turned the EPO into a “reign of terror”. He complains about terrorism now. Benoît Battistelli speaks of “inclusive society based on fundamental principles of freedom, equality and justice.” Seriously? Signed by Battistelli? “Says the man who keeps breaking German law and insists it’s OK because he’s enjoying immunity and impunity.”He says “sympathy goes to the victims, their families, relatives and friends.” Except those whose family and relatives Battistelli rebuked after his “Gestapo” drove loved ones to suicide? Says the man who keeps breaking German law and insists it’s OK because he’s enjoying immunity and impunity. What principles? Benoît Battistelli must be a sick, demented person if he wrote all the above himself and didn’t merely sign it. He speaks of “tolerance and mutual respect.” That’s like Stalin or Pol Pot speaking of tolerance and mutual respect. 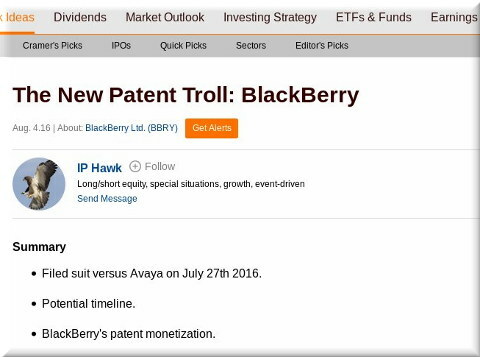 THE USPTO or the US patent system as a whole (including courts) is quickly becoming more hostile towards patent trolls, but even a company as large as BlackBerry acts like a patent troll now, having just filed lawsuits once again in Texas (BlackBerry is Canadian). The company now doubles down on this misguided strategy. It should alienate a lot of BlackBerry loyalists. BlackBerry has effectively completed its transition to a technology services and licensing-focused business model after signing a global brand and software deal with TCL. At the same time, BlackBerry patents are at the centre of a new litigation campaign that is kicking off in the United States. Under the terms of an agreement announced last week, Canada’s BlackBerry will license its wireless device-relevant “security software and service suite, as well as related brand assets” to Huizhou-based TCL, which will “design, manufacture, sell and provide customer support for BlackBerry-branded mobile devices”. Benjamin Henrion told me about BlackBerry that “ironically, they were one of the first to be attacked with NTP back in 2006 […] and not even a mention of the term “troll” in the IAM article, no surprise here.” Well, they almost never say "troll" (except in scare quotes).